A reader asked us to compile a list of Santa Ana’s private schools. But let’s start with Santa Ana’s charter schools, which are publicly funded but are run independently. Albor Charter School – This is a K-12 school that appears to offer instruction in a bilingual format. They don’t have a website and it is almost impossible to find out much about them online. I did find news articles that indicated that a former director allegedly misappropriated millions of public dollars back in 2007. Phone: 714-560-1568. The Orange County Educational Arts Academy – K-8. They offer English only and Two-way Language Immersion (Spanish/English). The Edward B. Cole Academy – K-5. They don’t have a website. I did find a letter they submitted to the City of Santa Ana where they indicated that they serve poor families with English fluency issues. Nova Academy Early College High School – 9-12. Students begin attending courses at Santa Ana College as early as the 10th grade and have the opportunity to begin vocational courses. The 11th and 12th grades (and 13th if needed) will focus on individualized learning and career plans developed by NOVA staff. Orange County High School of the Arts – 9-12. Established in 1987, the Orange County High School of the Arts (OCHSA) provides a creative, challenging and nurturing environment that offers bright and talented students unparalleled preparation for higher education and a profession in the arts. Bethel Baptist School – K-12. Located at 901 South Euclid. Calvary Christian School – Located at the Calvary Church over on the East Side, off of Tustin Ave. This program is sponsored by an evangelical church. Cornerstone Christian School – 1-12. Another Baptist school. Located at 1733 La Colina. Lycee International of Los Angeles – Pre-K – 12. Truly bizarre. They appear to teach in a Franco-English format and are trying to produce “renaissance students.” I guess if you want your kids to learn French, this is the way to go. They do have a campus in town over off of Fairhaven and Tustin. Maranatha Christian School – Pre-K-12. Located at 3800 South Fairview. 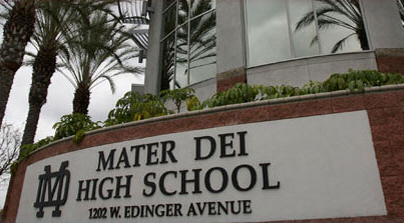 Mater Dei High School – A co-ed Catholic school. The City of Santa Ana has bent over backwards for them over the years. They are known in particular for their sports teams, particularly football. Like many other Catholic institutions, they have had issues with molestations. Newhope Assembly of God School – Pre-K – 6. Located at 917 S. Newhope. School of our Lady – K-8. Another Catholic School. Located at 2204 W. McFadden. St. Anne School – Another Catholic school. Pre-K – 8. Located at 1324 S. Main St.
St. Barbara Catholic School – K-8. Another Catholic school. Located at 5306 W. McFadden Ave.
St. Joseph School – K-8. Another Catholic School. Located at 727 N. Minter. There are quite a few others such schools that are primarily religious and Pre-K. You can click here to see a comprehensive list. My apologies if I ommitted any school of particular importance. « How can we save our Santa Ana public schools? Not much of an introduction and a very sorry pointless list. LOL! Everybody is a critic. Most families in Santa Ana cannot afford these schools, except for the charter options. The religious schools do give discounts usually to their members. I attended private schools, including Don Bosco Tech, in Rosemead. My kids are all in local public schools and they are doing just fine. Many families have given up on our public schools and for them the only options are to send their kids to private schools or to send them to public schools in other cities. SAUSD Trustee Audrey Noji did just that. She sent her son to a public high school in Irvine. I don’t think that our school board members and candidates should be sending their kids to private schools. If they want to be on our school board, their kids ought to be in the same fix as ours. At any rate, I tried to include links to the schools’ websites in this post so you can have a closer look at them on your own time. It is really hard to find info on some of these schools. I found it disturbing that several charter schools had no websites. They in particular should have websites. Well it seems you are promoting private & charter schools over public schools, but are they really much better? My son attends El Sol. I can attest to the fact that they are doing an excellent job at both dual immersion Spanish instruction and music. It isn’t easy to get in. The school is really doing a great job at community projects and becoming a support center for parents, particularly low income parents. I have plenty more info if anyone is interested. The worst part about the school is the physical site. Unfortunately, SAUSD won’t do the right thing and let a successful school take over one of the failing sites. If the school had a larger and better site, they could open up enrollment for many more than the current 500 enrolled. The school is a K-8 and their test scores are nothing short of amazing considering the population served. Why so negative about Mater Dei? They are a school for rich people who don’t live in Santa Ana and have benefited from too many subsidies from the City of Santa Ana. They either need to stand on their own or leave town.